The Intel Pentium T4300 (or Intel Pentium Dual-Core T4300) is an entry level dual-core CPU for laptops. Compared to the Core 2 Duo CPUs, the T4300 has only 1 MB Level 2 cache and some power saving technology is deactivated. Therefore, the power consumption in idle mode should be a bit above similar clocked Core 2 Duo CPUs. Furtheremore, virtualization technology VT-x is also not available for the T4300. Due to the slow clock rate and the small level 2 cache, the Pentium T4300 will limit the performance of demanding 3D games (e.g. Sumpreme Commander). For entry level applications like office, SD video cutting, image processing, Internet and casual gaming, the T4300 should be sufficient. 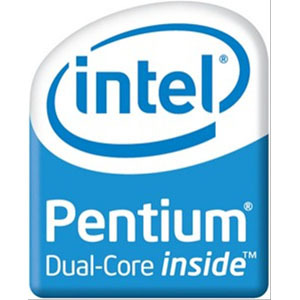 The Pentium T4300 is based on the Intel Penryn core and features 2 integer units, 1 floating point unit, 1 load unit, and 1 store unit in a 14-step pipeline. The Intel Pentium T4400 (or Intel Pentium Dual-Core T4400) is an entry level dual-core CPU for laptops. Compared to the Core 2 Duo CPUs, the T4400 has only 1 MB Level 2 cache and some power saving technology is deactivated. Therefore, the power consumption in idle mode should be a bit above similar clocked Core 2 Duo CPUs. Furtheremore, virtualization technology VT-x is also not available for the T4400. Due to the slow clock rate and the small level 2 cache, the Pentium T4400 will limit the performance of demanding 3D games (e.g. Supreme Commander). For entry level applications like office, SD video cutting, image processing, Internet and casual gaming, the T4400 should be sufficient. The Pentium T4400 is based on the Intel Penryn core and features 2 integer units, 1 floating point unit, 1 load unit, and 1 store unit in a 14-step pipeline.